Two academics from the School of Chemistry and Physics (SCP) served as the sole official judges for the Physics and Chemistry at this year’s Eskom Expo for Young Scientists, held in Boksburg. The exhibition allows students to have the opportunity to show others their projects about their own scientific investigations. 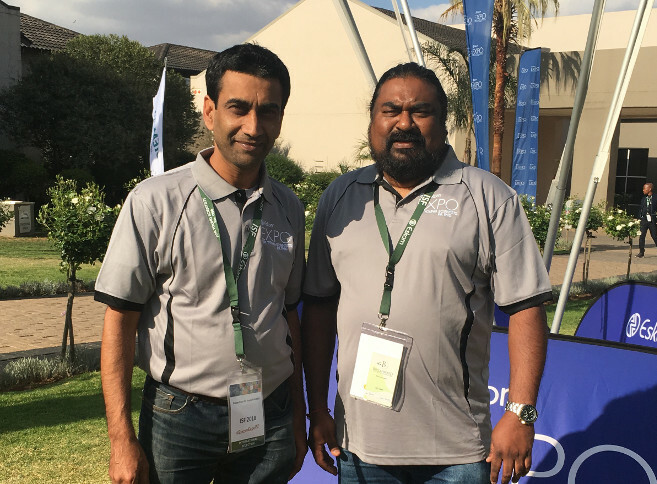 UKZN’s Dr Mervlyn Moodley and Mr Ajay Bissessur from the SCP were selected to contribute as judges in the event due to their involvement in the International Physics and Chemistry Olympiads (the IPHO and ICHO). The initiatives have exposed them to the international arena and enabled them to gauge international standards. The two academics have also been training the South African International Junior Science Olympiad (IJSO) team, who will participate in the 15th IJSO in Gaborone, Botswana in December, following a week’s training at UKZN. Participation in the Expo enables students to increase their awareness of cutting-edge science, and broaden their knowledge and their scientific horizons. At the annual Expo’s International Science Fair (ISF), selected students from 35 Expo regions in South Africa compete against the best young scientists from around the country and around the world. The prizes, valued at about R15million include bursaries to study locally and abroad, as well as, cash, laptops and an opportunity to represent the country at other international science fairs. Moodley and Bissessur’s participation involved the scrutiny and selection of projects that met international standards and whose authors could possibly represent South Africa at various international science fairs in 2019. Moodley judged the Physics, Mathematics and Statistics categories while Bissessur judged the various chemistry-related projects, ranging from pure chemistry to renewable energies. Their final selections took into account the novelty and scientific soundness of the projects, and Moodley said the chosen projects often do well in international expos. The Expo, which is the biggest scientific event for school-going children in the country, includes participation of learners from all regions within South Africa as well as some African countries, serves the purpose of attracting learners to Science, Technology, Engineering and Mathematics (STEM) fields and opening up their imagination to scientific concepts beyond what is taught at school. ‘It was amazing to see the quality of some projects and the enthusiasm and eloquence with which these learners present their projects,’ said Moodley, who also acknowledged where poor science curricula at schools or underprepared teachers are failing students, evident in some scientifically flawed projects. Moodley also noted the impressive efforts made by some universities to recruit top prospective Science and Engineering students through the offering of bursaries to study further.